“There is nothing more awful than to wear some new jewelry and have nobody notice it, a contingency you can easily avoid by making sure yours are Jewels by Flato, which is to say, conversation pieces.” So read an advertisement in Vogue for Paul Flato, Hollywood’s most influential celebrity jeweler. Greta Garbo, Mae West, Rita Hayworth, Joan Crawford, Doris Duke, Ginger Rogers, Marlene Dietrich, Katharine Hepburn, Vivien Leigh—they all loved and wore his designs, on-screen and off. In fact, not only was Flato the first jeweler to have his name in the credits of a movie, he even appeared in several films himself. Born in Texas in 1900, Flato moved to New York in 1920 to be a “big fish in a big pond,” as he put it. He spent a year at Columbia University, where he fell in with the young and wealthy set who later became clients of his fledgling jewelry and watch company. 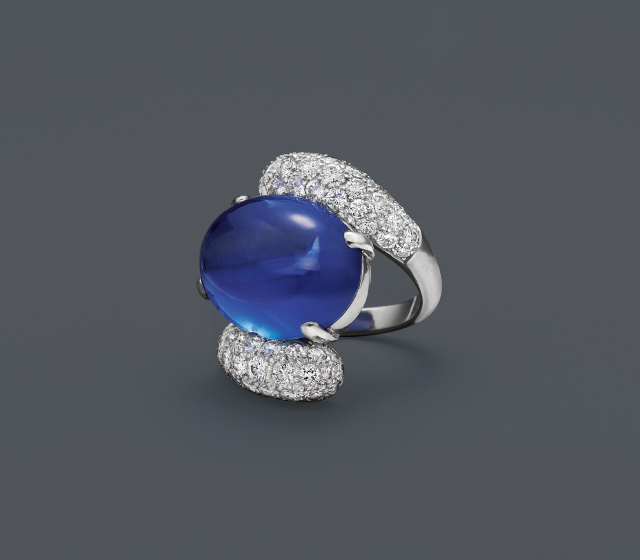 He employed several designers, including future luminaries George W. Headley and Count Fulco di Verdura, and bought diamonds from Harry Winston, who was a wholesale gem dealer at the time. Voyages to Honduras, Peru, Egypt, Greece, Mexico, Haiti and Guatemala inspired Flato’s inventive designs. In New York, he hobnobbed with politicians and socialites, thriving even during the Great Depression. By 1938, Flato had set his sights on Hollywood and opened a store on Sunset Boulevard. His new jewels were sculptural, surprising and whimsical, influenced by the tongue-in-cheek imagery of the Surrealist movement. Perhaps inspired by his own hearing loss, he created a series of gold clips shaped like hands posed in the sign language alphabet. A bracelet called the “gold digger” featured a gold pickaxe. A compact decorated with angels included one cherub on a chamber pot. Once, unable to find his cufflinks, Flato attended a party with bolts in his sleeves. Party guests raved, so he designed a pair in gold, launching a new trend. Flato created conventionally elegant designs, too, like his exquisite series of feather brooches in diamonds and platinum. He also embraced the 1940s trend of convertible jewelry—pieces that could be taken apart and worn in a number of ways. After legal and financial troubles, Flato moved to Mexico in the late ’60s and attained great success with a new collection of bold, witty styles that took inspiration from local folk art and artifacts. He continued designing jewelry until he returned to Texas at the age of 90 to live with his daughters.